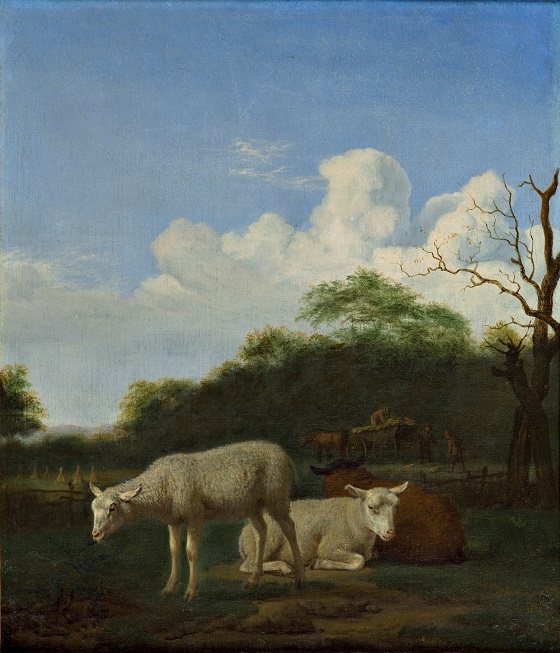 During the 1640s, Dutch painters such as Paulus Potter and Aelbert Cuyp began to develop a new style of landscape painting where livestock assumed a prominent role and humans only featured as staffage. Adriaen van de Velde was particularly influenced by Potter’s animal paintings and was among the landscape painters who continued this tradition. This work lies somewhere between a landscape painting and animal study. A white and brown sheep have found a peaceful spot to rest, while a third decides to nibble on a thistle. In the middleground of the painting, a peasant is loading hay onto a wagon, while a blue sky and dense forest fills the background. The three sheep occupy a central position in the composition as the subject of the painting, while the hard-working peasant and countryside are relegated to the background.